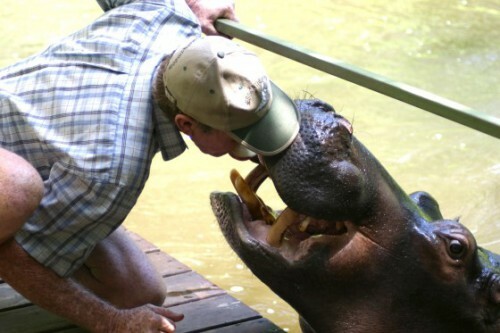 Weighing in at a modest 1,400kg, Jessica the hippopotamus considers herself a human, with dogs as her best friends. A movie star with her own fan club and web page, she loves Rooibos tea and has several suitors. The hippo was a mere 16kg when she was found a few hours old on the banks of the Blyde River, near Hoedspruit, with her umbilical cord still attached. Frail and weak, she could not stand up. And now at 13 years and 11 months she has become one of the country’s most renowned tame animals. Help feed her and give her favourite Rooibos tea and then touch and play with this unique animal!